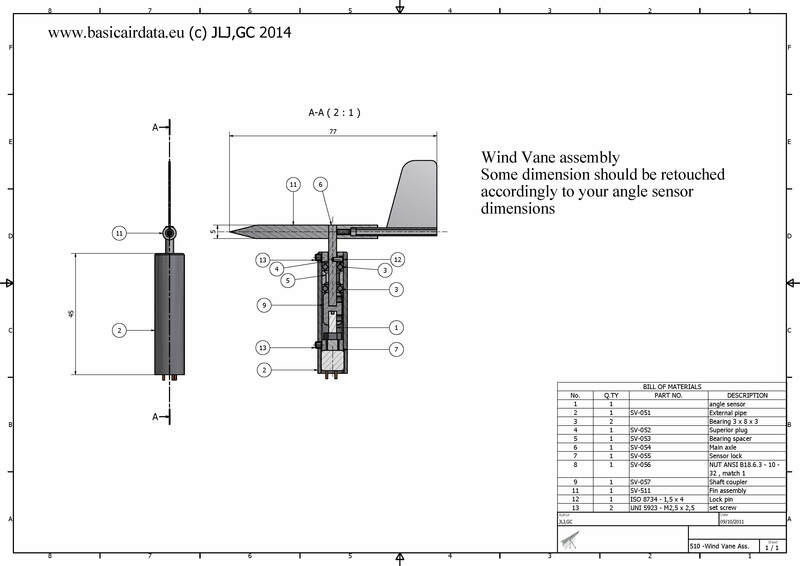 The angle of attack wind vane, or alfa beta construction drawings are available here. Angle of attack can be measured by mean of a mechanical wind vane. Here below detail drawings for make your own vane, some dimensions can vary from this exposed example. This kind wind of vane can be used as stand alone unit or integrated into an airdataboom or in a alfa-beta vane. We introduce the angle of attack measurement using wind vanes. The topics to be covered in this section are design, practical issues, modeling and model cross-validation. 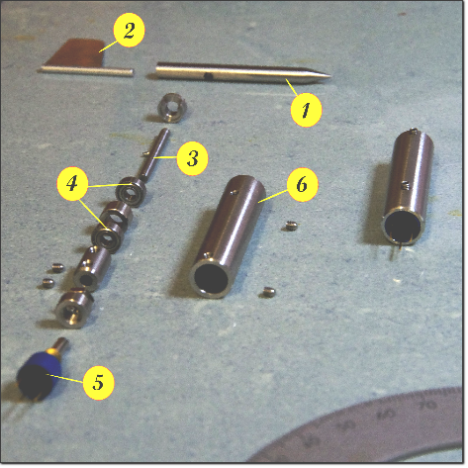 Equally important to the instrument itself, is the definition of the quantity under measurement: an adequate design requires stating specifications beforehand. Initially, our focus will be turned towards common design aspects and then some specifications will be proposed. A lot of references regard weather vanes specifically; in principle, it’s a valuable resource but not very helpful when it comes to design requirements. Another issue to be taken into account is that the motion of the mount at the wind vane mounting point can interact with the wind vane dynamics. To avoid performance degradation it is crucial to maintain the resonant frequencies of the two systems well apart. Since the air-boom doesn’t have a simple geometry, the calculation of the vibration modes is not feasible using a closed form formula. A 3D model needs to be created in a computing environment and FEM modal analysis be carried out. Alternatively, lab tests are also a way to obtain such data. Figure 3 depicts the first mode of the probe. Elmer is a notable open FEM package that can be freely downloaded and can handle dynamic analysis. Generally speaking, the stiffer the airboom, the higher its first resonant frequency will be. Higher airboom resonant frequencies are desirable, since they present an uppper performance limit for the wind vane. As a rule of thumb, if the airboom assembly moves under a slight force of the hand while while fixed on the ground, some vibration-related problems are to be expected. More accurately, if numerical analysis tools is available, make sure that the first resonant frequency of the airboom is far from the desired wind vane operational range. An offset of at least 0.3 times the first mode frequency is a good, conservative value. Resonant frequencies of higher order can be usually neglected, as they carry significantly less deflection energy. For best performance, it is always a good idea to make sure that to other vehicle components create excitations in the low to mid frequencies of the wind vane. Let’s proceed by examining wind vane behavior; refer to Figure 1. The most critical components are the bearings. A Coulomb friction model will be used to describe their static friction. The phenomenon of static friction, or stiction, results in the torque that is necessary to start rotating a resting bearing being greater than the torque required to keep it rolling. A graph representation of this phenomenon is found in Figure 4. This non-linearity leads to some problems when it is incoroporated in numerical integration algorithms. Firstly, longer integration calculation times are to be expected. Furthermore, limit cycles and solution collisions may be generated, in other words the solution may be non-steady/cyclic or converge to a terminal value that yields a non zero static tracking error. Analysis can become much neater if the model is writen down as a Filippov system: a nice, sliding bifurcation arises. ommonly, the vane dynamic behavior, at least near equilibrium, can be assimilated as one of a second order underdamped system. Standard industrial methods for determining the dynamic performance of a wind vane also exist, for example ASTM—D5366 “Standard Test Method for Determining the Dynamic Performance of a Wind Vane”. fixation point and 0 mm at the root 1. Modeling the dynamics of the wind vane as a second-order system, we end up with two significant parameters of the system: resonance frequency and damping. Initially, bearings and other sources of friction on the main shaft will be neglected. A known resonance frequency value is used to verify that the wind vane is not excited by other mechanical devices, as depicted in the previous section. Wind gusts are generally an intended source of AoA readings, but we must ensure that their frequency content does not approach or exceed the resonance frequency, so as the frequency response of our system has unity magnitude. 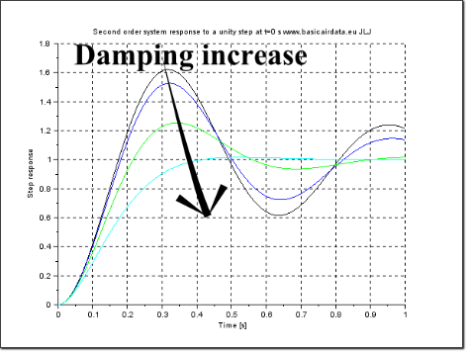 Damping indicates how faster an excited oscillation decreases with time. 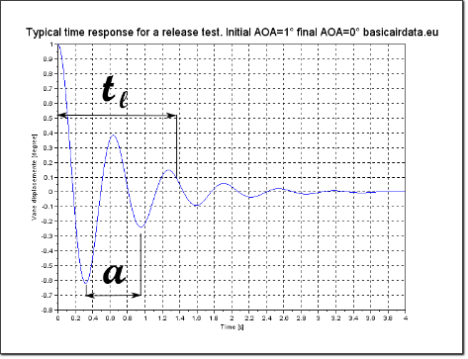 The figure 5a illustrates the time response of a second-order system, while varying the value of damping. Our wind vane will be underdamped, hence its damping value will lie within the (0,1) range. The following equation defines a second-order transfer function using common notation. 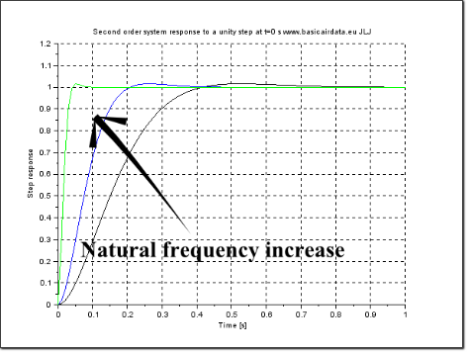 Since our vane will be underdamped, the typical time response will be oscillatory, with an exponential time decay term which reduces the oscillation magnitude in time. is the damped frequency, oscillation in time occur at this frequency. Inspection of the previous figures reveals that for good system behaviour (fast and stable measurements) we need a high value for both resonance frequency and damping. A SciLab file available for experimenting with parameter values can be found here. To increase wind vane resonance frequency, much like many mechanical systems, inertia decrease is required. Our wind vane is statically balanced with a fore mass and the overall weight can be decreased by enlarging the distance of the counterweight and decreasing the distance of the fin from the rotation axis of the vane. On the other hand, using a long fin arm will increase the damping of the system which is an also desirable characteristic, as is also described here, eq.6. Thus, we end up with two conflicting requirements in our design phase. If an extremely fast dynamic response is needed, the ideal design is a leading edge wind vane, which is a vane that pivots directly in the leading edge of the fin, with no counterweight. If high values of damping are required, the classical long-armed wind vane is more promising. Since there is no dominant argument when choosing those values, a value greater than 0,15 is a good start, in order to avoid uncontrolled oscillations during operation. A damped system oscillates at the damped frequency of eq.2, as per figure 5b. When damping is low, is close to the natural frequency. Natural frequency should be two times the maximum frequency of the measured quantity, in order to ensure unity measurement gain. Also, as has been said in the previous post, resonance frequency should be lower than , or at least, this is a good first estimate; the more distance between the two resonance frequencies the better. In a typical operating scenario, the vane will have to deal with a constant wind, with gusts superimposed on it. For design and simulation purposes gust models are available, such as the Dryden, FAR and FAR2 models. Wind gust library blocks also exist in many simulation packages. The Dryden model is based on a stochastic representation of wind gusts. Using the autocorrelation function spectrum of gusts, it creates a filter that produces time domain signals, once fed with white noise. Neither Dryden nor FAR models intend to provide a very accurate result. However, they are useful because they provide us with a probable shape of wind gusts and a base for comparison between vane designs. During the preliminary design stages we will use the FAR model and consider the Dryden model during simulations. The gust model is used to produce the wind magnitude response on the z-axis. Setting a baseline of zero constant wind, the total wind is assumed to be blowing exactly perpendicular to the ground with upwards direction. Recalling that wing section relative speed is equal to the vector sum of groundspeeed and windspeed, it is apparent that in level flight, variation of vertical wind speed will lead to variation in AoA; if vertical speed rises, then AoA increases as well and vice versa. The figure 6.1 depicts a one cosine FAR gust shape. Its wind components are assumed to act independently and only the z-component is shown. 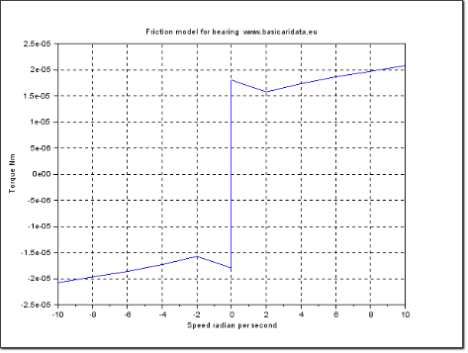 Customize the parameters with your test conditions: download the plot file here. There is no such thing as correct gust parameters; during the design phase a worst case scenario approach will be applied. This scenario should reflect the airboom intended use and the flight platform on which it will be mounted. 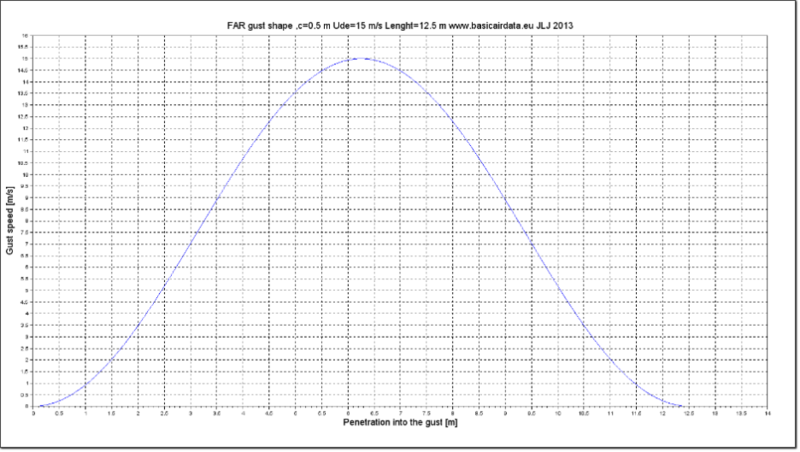 The length of the gust gives us an indication of what is the impact of the vane dimensions on its accuracy. In short, it’s impossible to measure a 10 cm gust with a 25 cm vane, since given this size, the tip of the vane would be immersed in one gust while the tail still lies in the previous one. An ideal airborne vane has a decay distance equal to zero, but for the proposed vane a 50m value is a good starint point. However, this value only leads to a static performance specification and doesn’t correlate with dynamic behaviour. According to Figure 6, the gust has a maximum derivative value equal to . From table 3 in this reference link, we get the time response of a second order underdamped system to a ramp input; the time domain output is the sum of a ramp, an offset and an oscillating term. The third term, a pure offset error, decreases as natural frequency increases. The second term is dominated by a time constant of magnitude , hence the oscillatory behavior can be reduced also by a increase. Before proceeding, we summarize the simplifications and the parameters that will be further employed. Now that the wind vane design requirements have been set along with its performance bounds, it’s time to explicitly correlate the vane geometric and aerodynamic characteristics to performance parameters. After all the mathematical background has been laid out in the two previous sections, the design procedure based on a numeric example will be discussed. 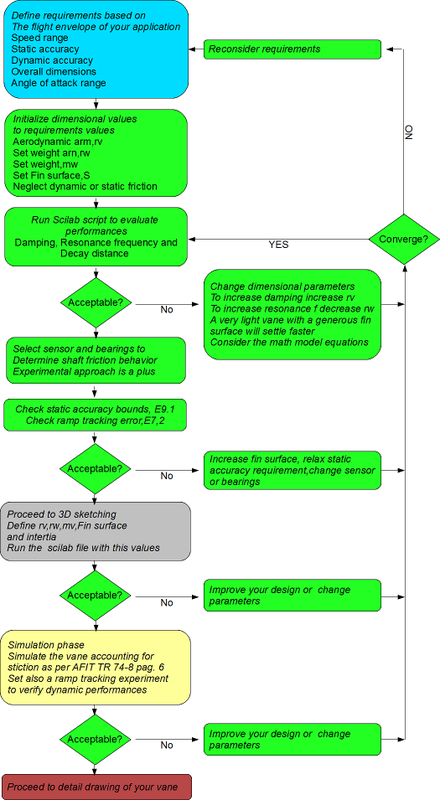 Refer to the following scilab file: it’s a simple script file to evaluate the windvane parameters. For the sake of simplicity, when possible, the nomenclature is that of the common, freely available, reference “Wieringa (1967),Evaluation and Design of Wind Vanes, Royal Netherlands Meteorological Institute, De Bilt” By the end of the post a compact set of equations and a basic procedure for wind vane sizing will have been presented. The design process is recursive and requires going back and forth through the specification, 3D design and performance evaluation phases. Strictly speaking, finding the best windvane design can be seen as a multivariable, multiobjective optimization problem. To avoid an explosion in complexity, only a basic approach to design evaluation is presented in figure 9.3. Note that our fast preliminary design is possible thanks to the availability of a closed-form mathematical model for the vane. Results and performance evaluation can be eventually refined further, through a successive simulation procedure. Consider the proposed model for the main shaft bearing friction in Figure 8.1. The friction curve is over-estimated so that the torque values are conservative. To be more general, consider also that torque values are the sum of the torque generated by all friction sources on the shaft, including those caused by the position sensor. Table 8.1 reports the approximate torque generated by the lift of the fin at the shaft: 5.75e-05 Nm for a wind blowing at 30 m/s. The aerodynamic torque that our vane generates for an of 0.1° at 30 m/s is greater than the torque of 2e-5 Nm necessary for the shaft to begin to rotate. At 30 m/s the vane will hopefully correctly rotate to 0.1° . In a different scenario, if the speed is reduced to the lower bound of required speed range, in our case 10 m/s, the aerodynamic torque is 0,6e-5Nm and the windvane will not rotate to 0.1°. At the former speed the static error will not be smaller than 2/0.6*0.1=3.3e-1 deg. Assume that the force produced by the windvane fin is linear in terms of Cl and, in turn, Cl is linear in terms of . By dividing the static friction torque at 0.1 degree by the value of the available torque at 0.1 degree of , we can calculate the multiples of 0.1 degree where enough lifting torque is produced by the fin to start the rotation. In this case it is 3.3 times 0.1 degree, or 0.33 degree. In those cases where it’s not possible to reduce the friction, it is necessary to increase the wind vane fin area, so that the vane will generate more torque. Table 8.1 shows a low damping ratio, quite different from our initial requirement of a value greater than 0,15. Recalling that our current model neglects the bearing damping some considerations should be added for a correct interpretation of the results. 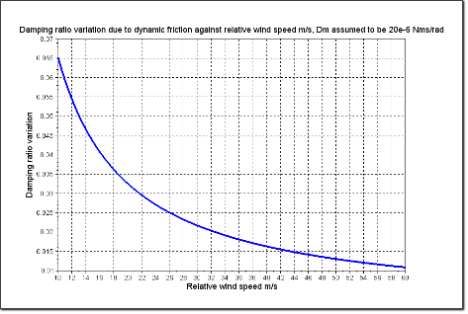 Note that when wind speed is very high, since friction torque contribution is small compared to the torque generated by the fin, the behavior of the vane will be essentially as predicted by the model. A very lightly damped response should be expected. At lower speeds the contribution of friction is not negligible and leads to an increase in the response damping. Wieringa Eq.30 add a viscous term proportional to rotation speed to the ideal case model. No static friction is considered. Other authors, for example “1974, JAMIES T.KARAM, JR. TECNICAL REPORT AFIT TR 74-8” page 6, have considered stiction. Again, according to Wieringa the damping ratio variation against relative wind speed is plotted on the Figure 8.2, which corresponds to the example vane. In order to add damping at higher speeds, some mechanism, either aerodynamic or mechanical, can be employed. 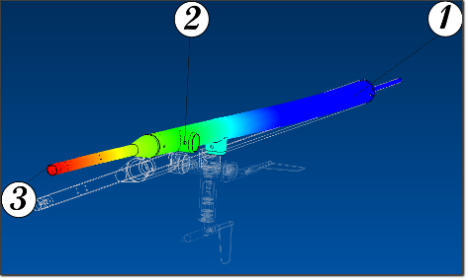 The example probe does not use any such means to compensate for relative wind speed. Usually the requirements of the sensor for the vane angle favours the use of low friction devices; Hall-effect sensors have been successfully employed. An example of a commercial sensor can be found here: typical rotary sensor at this link. The whole design process is somewhat recursive. The following Figure 8.3 depicts a possible design development path. Pay attention to the fact that post-design simulation and testing should be carried out on the vane. 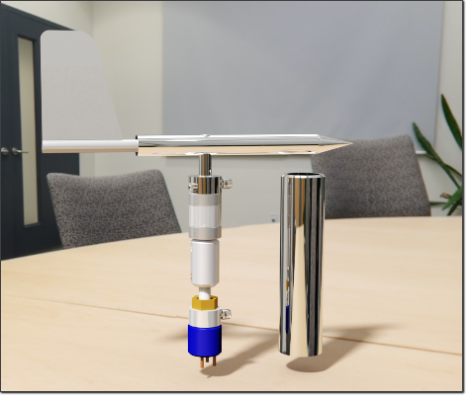 Although this part is not treated here, this validation is considered a significant point in the overall design procedure.